Will Brexit mean a filthy bonfire of the regulations protecting our lungs? Each of these 40,000 deaths is experienced as a calamity for the families involved, as painful and permanent as my own experience of grief. And if that is not reason enough for concern, the RCP estimates that air pollution in the UK costs us £20 billion a year. 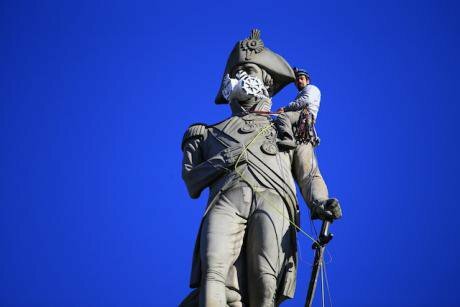 Currently, the amount of air pollution produced and tolerated in Britain is limited by regulations imposed by Brussels. Red tape. Green tape. Unfreedom. Britain is already acting as the tailpipe of Europe. It broke its air pollution limits for 2017 just a few days into the year, according to the environmental pioneers at Greenpeace. The European commission has issued a ‘final warning’ but what power can this move have when the UK will not be answerable to the commission within two years? The global implications of a Dirty Brexit are even more stark: many of the actors behind Brexit are also climate deniers lobbying for the repeal of the Climate Change Act. Chief among them is Lord Lawson, Thatcher’s “bankrupt chancellor”, or best known today as Nigella’s father. David Powell of the think tank New Economics Foundation (NEF) told DeSmog UK in July last year: “The question is not whether Brexit damages UK’s chances of acting on climate change. It is whether there is more power now to those who don’t think the UK should do much on climate change. On the face of it, the answer is possibly ‘yes’ and that is a worry. A Dirty Brexit allows the British government to perform a bonfire of air pollution regulations, and a Conservative-led administration has every motive for doing so. The ideologically driven assumption is that deregulation allows for greater industry, more growth: more jobs for voters and greater profits for party donors. Dirty Brexit is certainly the ambition for the activists who worked hardest and gave most to the reactionary Tory / UKIP Brexit campaigns. Lawson as president of Conservatives for Britain, a faction within the Vote Leave campaign, set out his stall in a speech to Chatham House in February 2016. “Even more costly is the burden of EU regulation, particularly damaging to our small and medium-sized businesses. This has been reliably calculated at getting on for £25 billion a year. “And the flood of new EU regulation is unceasing – partly because it is an article of EU faith that ‘more Europe’ must ipso facto be a good thing; and ‘more Europe’ is all too often interpreted as more EU regulation. The face of Dirty Brexit privatised the British energy industry in the 1980s, and after crashing out of frontline politics became founder chairman of Central Europe Trust – a consultancy that has worked with “Europe’s colossal coal polluter”. More recently, he reappeared as chairman-for-life for the climate denying Global Warming Policy Foundation. Lawson currently lives in the South of France, where I can attest the morning air is as clear as a stoney Pape Clément Blanc. But the transfer of powers from Brussels to London does not necessitate the roll-back of climate and environmental regulation: the potential opens up for the government to implement even more stringent restrictions on pollution, having lost the excuse that such issues are safely decided at a European level. We are at a crossroads. We can chose Clean Brexit, a country where people democratically opt into environmental regulation, enhancing the potential to become a world leader in sustainable energy. Or we can chose Dirty Brexit: A polluting workshop for cheaply made goods banned in the European single market but traded with dictatorships and destined for landfill in China. What does it matter if we kill twice as many people as live in Rutland each year if we have a slightly better chance for a slightly higher return on our investment? Theresa May has attempted to rebrand Hard Brexit as Clean Brexit. European officials have threatened a Dirty Brexit, a no deal Brexit. But the destination is as important as the speed and comfort of the journey. So where are we headed? Who has the wheel? The belief that we as a nation have a common goal, of sustainability and equality – or at least meritocracy – can no longer hold. So how will the Clean / Dirty Brexit decision be made and by whom? Whose interests will be served? How do we ensure that our interests and the common interest are not marginalised? This is the question I am tasked with answering during the next two years. This is the challenge openDemocracy set itself when applying for funding to the Polden-Puckham Charitable Foundation. It’s a question far too big for any one news site, which is why we graciously invite you to climb aboard.